Liz Sieber in her new store, Select Shop 215 in Old City. 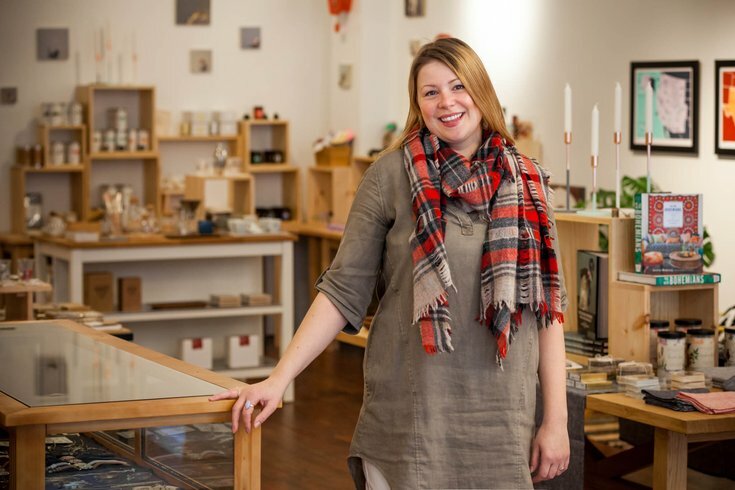 When Liz Sieber opened up Omoi Zakka Shop, a carefully curated store inspired by her trips to Japan and now full of globally sourced wares, in 2006, Philly quickly embraced it. Nearly 10 years later, the store is now fully enveloped into Philly's shopping scene, providing loyal customers with Japanese stationery, cutesy home goods and stylish accessories. The store became so full of goodies and customers, in fact, that this fall Sieber was able to open a sister store, Select Shop 215, in Old City. This store is a little different than Omoi, with less of a focus on writing utensils and pretty notebooks (though you'll still find a thoughtful stock) and more decor, beauty products and accessories. Customers at either of Sieber's stores may feel her personality in every corner, but below she gives the real scoop on her favorite places and the beauty of a new notebook. What’s your favorite boutique in the city? Besides your own, of course! What draws you to stationery? There’s something so promising about a blank page or beginning a new book and the satisfaction of creating something that will become well used and well loved. Something like a notebook, a pen or pencil and whatever else you choose to add can be as colorful or austere as you want, a collection as spontaneous or manicured as you feel necessary. Your tools don’t judge. What is your favorite thing to do in your neighborhood? My partner and I are on a kick of waking up early on weekends and, at least, trying not to goof off all day long. We walk to Grindcore House for coffee and plan our day, even if we just turn around and binge on Netflix all day. What song or album has been stuck in your head lately? I create the playlists that we play in the stores so I love discovering new songs and new bands. Lately, I have Thee Oh Sees on heavy rotation and I always really like Purples’ "Get Hurt” every time it comes on in the store, plus they’re from Philly! What city haven’t you visited that’s on your travel to-do list? Tough question, especially so much of the emphasis of the shops is based around featuring products and designers from around the world. I’ve always wanted to visit Chicago and Rotterdam - I must have cities along rivers on the mind.